Thalassaemia is a disorder in which the body makes an abnormal form of haemoglobin, resulting in the excessive destruction of red blood cells. So, when there are aren’t enough blood cells to meet the body’s requirement this results in anaemia, which is why such patients require blood transfusion regularly. In the initial stages a patient may need a transfusion once a month but the frequency generally increases to once in 15-20 days or even a week. Hospitals in India are generally apathetic towards thalassaemics, an attitude that causes delays in blood transfusions. In such a situation, patients have to rely on donors. The situation is worse for patients of negative blood groups, as this blood is always in short supply. More than the painstaking treatment and the mountain of medical bills, it’s the struggle to get blood, unsafe blood transfusion practices and insensitivity of doctors which make life hard for thalassaemia patients in India. Most thalassaemia patients in India are completely dependent on the Red Cross Society for blood as other banks, including the Rotary Blood Bank, charge an exorbitant amount. They also rely on the blood bank of the hospital where they have been receiving blood transfusion since their birth. So, in case of shortage of blood at the Red Cross, these patients approach their hospital’s blood bank. And the misery doesn’t end here. There is always an impending crisis which is waiting to engulf a thalassaemia patient. 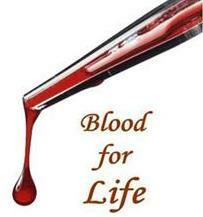 Transfusions increase the risk of contracting blood borne infections such as HIV and Hepatitis. Though better screening facilities have brought the risk down significantly, this still exists. Increased awareness about the disease, more effective medication as well as better screening of blood has improved the quality of life for thalassaemics. One of the major problems, however, is the iron overload in the body caused by the repeated blood transfusions, which still the remains the main cause for thalassaemia deaths. Typically those who need a significant number of blood transfusions usually have an excessive amount of iron in the body which needs to be removed through a treatment called chelation therapy, as excess iron can damage the heart, liver and endocrine system. Drugs known as ”iron chelators” help rid the body of excess iron, preventing or delaying problems related to iron overload. This medication is administered intravenously by using an infusion pump. Generally, the pump is put on at night on the stomach or thigh, and a slow infusion of the iron chelating agent is administered over a period of about eight hours. Though effective, most patients prefer pills over liquid medicine as it is inconvenient to sleep with a needle pricked into your skin. Unfortunately, these iron chelator drugs have wide- ranging and serious side-effects such as fever, headache, nausea, stomach upset, vomiting, convulsions, bone marrow depression (dropping blood cell counts), a drop in blood pressure, cardiac arrhythmias, respiratory arrest, and hypocalcemia. Other concerns include kidney failure, which can require permanent life-limiting and expensive dialysis, or cause death. The cost of treatment poses a major burden for thalassaemics. Many line up at government hospitals to avail of free treatment, and forget about being choosy about which drugs are provided. Some, however, are compelled to pay for a different regimen. Some people with this disease may live completely normal lives and pass on the disease (which gets carried over several generations) without being aware of it. But, unfortunately, when one person with thalassaemia minor carrier happens to marry another with the same diagnosis, there is a strong possibility that their child would be thalassaemia major. With existing thalassaemia patients struggling for regular blood supply, it’s difficult to imagine the future of those 10,000 to 20,000 new patients born in India every year. The only way to control this hereditary blood disorder is through awareness and prevention. For instance, thalassaemia was a serious health problem in Cyprus about three decades back when 1 out of every 158 births suffered from thalassaemia. But since the introduction of strict screening laws in the 70s which included pre-marital and prenatal screening and abortion, the country has almost eliminated the disease from their population. To save our child from inheriting a genetic disease or disorder such as Down syndrome, thalassaemia or haemophilia, every women of child-bearing age should go for recommended tests. For thalassaemia, a simple blood test called haemoglobin electrophoresis would tell if a mother is a carrier of thalassaemia. And, if a woman happens to be a carrier then her husband is tested for the same as a child inherits the disease only when both the parents are carriers,” says Dr Sushila Kataria, internal medicine, Medanta-The Medicity, Gurgaon.